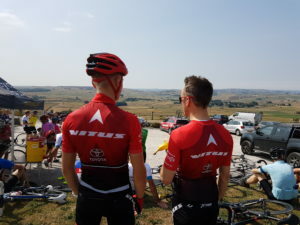 Fresh from returning from the French Alps, taking on both the Col de Joux Plane and the Col de la Forclaz, and with Cyclone24 Derby on the horizon, our Directors took to the Derbyshire Hills with Smith Cooper and British UCI Continental team Vitus Pro Cycling. Despite yellow weather warnings, the morning brought clear skies and a big yellow sun. First up was a spot of breakfast, a welcome from David Nelson of Smith Cooper, followed by a team introduction from Team Director, Cherie Pridham. The only female owner and manager in the British peloton, Pridham rode in 10 Grand Tours in an era of epic rides for the women’s sport. Her managerial expertise has also yielded victories in some of the most prestigious races on the domestic calendar. Setting off from the historical Cromford Mills, the gruelling 55-mile circular route, ascended over 5000m and took in some stunning locations such as Hope Valley, Baslow and Chatsworth. A tough but rewarding route, giving some amazing views across the Derbyshire Peak District. 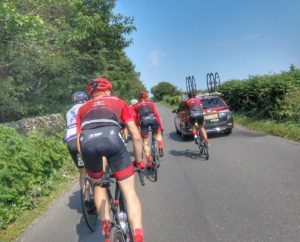 And despite all those hill climbs, there was still time to get some great insights from the team about their training and of course their thoughts on Cylcone24! Many thanks to Smith Cooper & Vitus Pro Cycling for a fantastic day.